Graham Greene's novel of the same name was turned into Joseph L. Mankiewicz' "The Quiet American" (1958). In so doing, Greene inserted a new phrase into the world lexicon which did not catch on quite as well as "ugly American," but that's life. What, exactly, Greene meant by the phrase is open to interpretation. In the film, Audie Murphy puts about as good a spin on it as was possible, as he was the quintessential "quiet American" who carried a big stick and spoke through his actions. 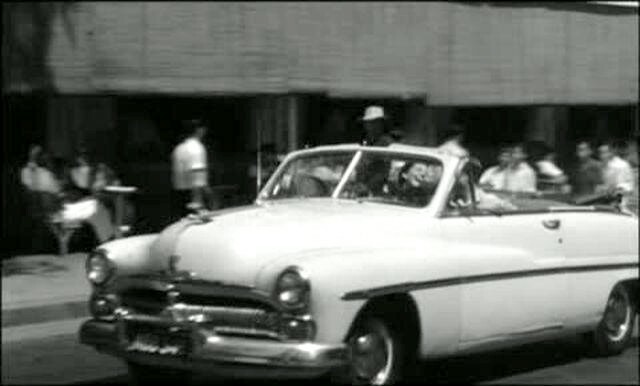 1950 Mercury Convertible in "The Quiet American." 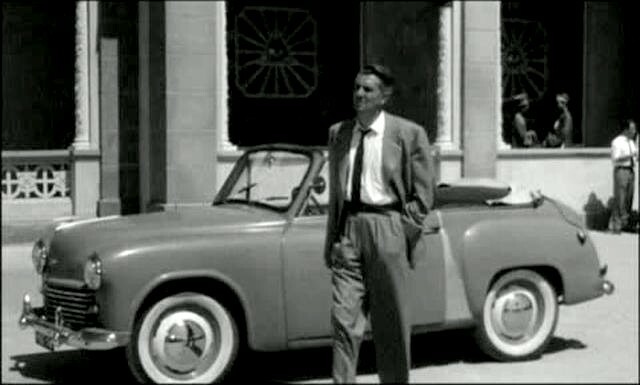 For modern eyes of a certain bent, though, the real stars of this film are the automobiles. The prop department of this film managed to corral one of the most exotic lineups of classic cars in movie history. Anyone who can accurately name all of them without using any reference truly is a classic car buff, because there are some really obscure foreign names. 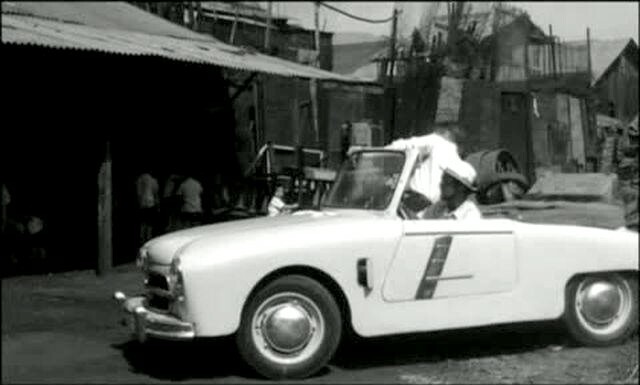 A Peugot 202 in "The Quiet American." Getting back to the title, the phrase "the quiet American" certainly entered the lexicon as surely as "the ugly American." But what does that mean, though? This film, surprisingly, doesn't really answer that question, though it gives some hints. What it does do is give some insight into the Vietnam miasma years before America's leaders finally caught up to this film. 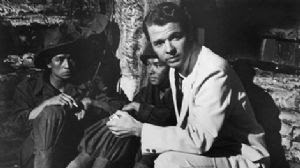 Audie Murphy in "The Quiet American": still waters run deep. It is difficult to watch this film and not read fairly obvious political implications into almost everything that happens. But what is most striking is the role of terrorism at the heart of the story. All of the characters revolve in orbit around Vietnamese events that keep popping - or should I say, blowing - up in the most unexpected places. And nothing is ever really resolved. Not even the crime at the center of the story. 1950 Simca 8-1200 Berline in "The Quiet American." 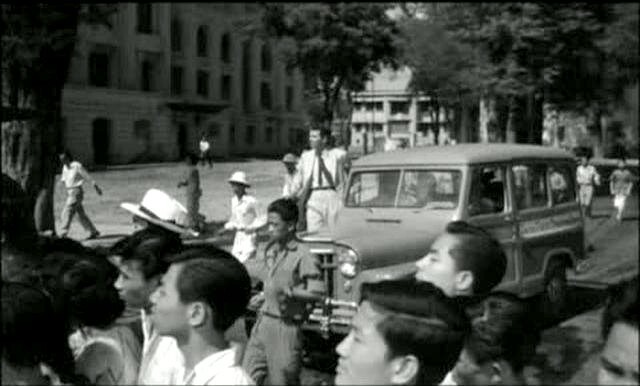 To read each character as a political paradigm is almost too easy, and if the film has a major flaw, it is that the characters are a bit too starkly drawn as representing their nationalities and not unique personalities. The American ( Audie Murphy), who isn't very quiet at all, by the way, is brash and forward. He is the new kid who blunders around, intruding on murky relationships with the naiveté of the guileless, the Lone Ranger completely out of his element. Audie Murphy does a fine job portraying him, the lack of subtlety in his acting style perfectly complementing his character. 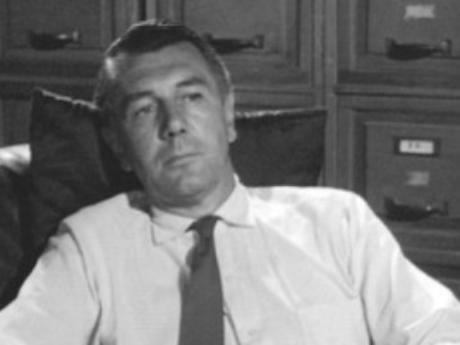 Michael Redgrave, trying to figure things out in "The Quiet American." Michael Redgrave is wordy and unctuous as the British journalist, Fowler, who is having an affair with a beautiful but ultimately vacuous Vietnamese girl, Phuong (Giorgia Moll). He is duplicitous and double-dealing, but also naive in his own ways. Clearly worn out and trying to save something permanent from the wreckage of his time in Vietnam, Fowler keeps grasping for happiness without ever understanding that can never happen. 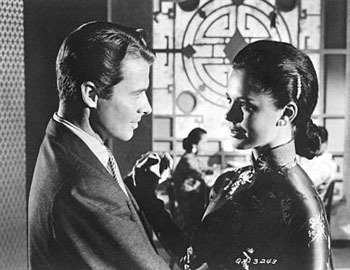 The main difference between Fowler and the American is that Fowler has longstanding ties to people and places in Saigon. He has come as close to "going native" as he can without losing his identity completely. The energetic American has no such ties, but eagerly seeks to rupture the Old World ties and make them his own. Obviously, this sets up conflict that cannot be resolved amicably. The Old World vs. the New, battling to dominate a country that itself is beginning to find dominance disturbing. In essence, all three parties have an agenda, and only one can fulfill it. 1949 Hillman Minx Phase IV Convertible in "The Quiet American." The Old World Fowler lies to everyone, even to himself, to keep things as they are. The status quo is important to him because he realizes that the inevitable change he is denying will not be to his advantage. The American, on the other hand, is painfully honest in a charismatic but ultimately empty way. As Fowler remarks, it would be better for the American if he had a few faults of his own, then he might understand others better. Which is a very charitable view of the American. Fowler at least understands himself and his depravity, whereas the American just seems to understand empty concepts like self-determination and national longings without any hint of introspection or where those fine words ultimately must lead. 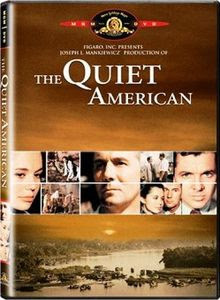 Who is the prey in "The Quiet American"? Lots of skullduggery afoot. The film is talky, and if you are not engaged by Fowler's various moral dilemmas and conflicts, it can get tedious. 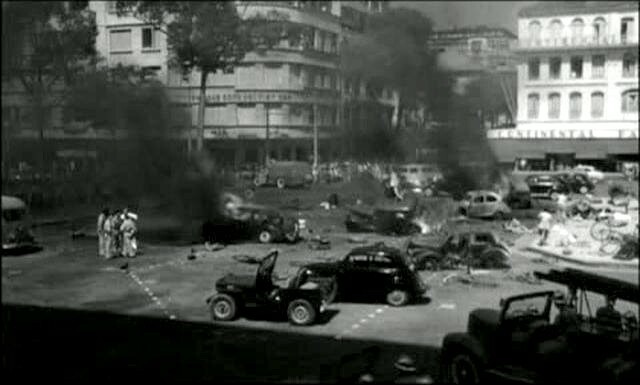 The scenes of Saigon are the film's best part, it is quite incredible to see how advanced and almost elegant Saigon was before the American involvement and Communist takeover. Too bad the film was not shot in color. 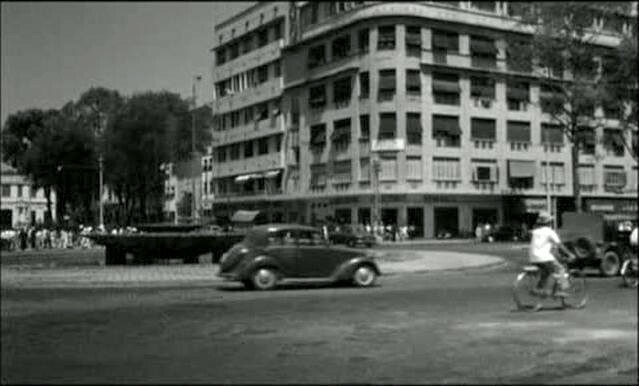 Very civilized settings are ravaged by terrorist bombs, which may have seemed novel and exotic in the 1950s, but unfortunately seems quite common now. 1954 Panhard Junior Roadster (customized) (X87) in "The Quiet American." The story itself is incredibly far-sighted. Terrorism is a modern concept, and thinking that its practitioners always lose in the end is as naive as the Americans thinking they can pick a winner in Vietnam. Fowler, while full of profundity and fancy words, is used by the Communists to get out the story they want known. He dutifully complies, the perfect tool, without hindering their activities in the slightest. Meanwhile, his world collapses and he loses everything he had in the city. The American loses, too, but in quite a different way. But you know that others like him will be back. Who wins? Well, the answer to that should be obvious. 1956 Willys Jeep Station Wagon. Worth seeing at least once. Not, as some claim, Graham Greene's best work, but still a fine meditation on Southeast Asian events before they actually occurred by someone who understood.